Armen Shakoorian joined the Bakersfield office of Mullen & Filippi in 2017. He represents insurance carriers, third-party administrators, and self-insured employers with respect to workers' compensation claims and related matters. 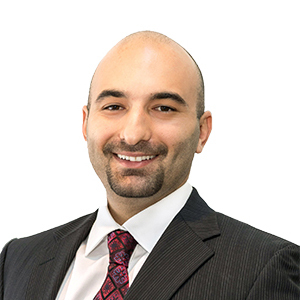 Armen received his Juris Doctorate from California Western School of Law, while at the same time earning an MBA from San Diego State University. During that time, Armen was a member of the Business Law Society, as well as an endowment portfolio manager for SDSU. Prior to earning his graduate degrees, Armen attended the University of California, Santa Barbara, where he majored in Political Science and minored in Philosophy. He earned dean's honors, making him a forever proud Gaucho. Throughout college, Armen was an active participant in Mock Trial, while holding a two year internship at the Santa Barbara District Attorney's Office. Armen is a member of the State Bar of California and a current member of the Workers' Compensation and Real Estate law sections of the State Bar of California. He is also a member of the Kern County Bar Association, as well as an active member and participant in the Young Lawyers Section. I am fully dedicated to my job and strive to achieve the best results for my clients. My emphasis is on resolving claims quickly and effectively. The paramount goal is to keep my clients satisfied by achieving results and keeping open lines of communication in every matter I handle. During my spare time, I enjoy investing in financial markets and staying abreast of geo-political developments. I take my health and fitness very seriously and dedicate at least one hour each day to exercise, while refining my gourmet cooking skills at home. To add entertainment in my life, I enjoy playing the guitar and particularly enjoy the blues and classic rock music. My intellectual hobby is amateur astronomy and my biggest passion is bow hunting in the rough terrains of our national forests in California.